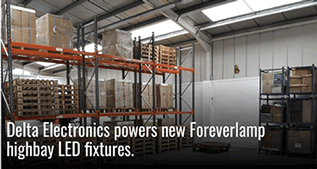 Delta Electronics powers new Foreverlamp highbay LED fixtures. Foreverlamp™, a leader in LED high bay lighting solutions, has partnered with Delta Electronics Group to develop the electronic power supplies for its’ latest LED lighting fixtures; the Classic High Bay Series. Foreverlamp previously chose Delta to supply their highly-efficient, quiet, safe, and smart ventilation fans that is key to Foreverlamp’s active internal cooling management system for its’ plug and play LED high bay lamps. The strategic engineering and design partnership between Foreverlamp and Delta Electronics resulted in an innovative and reliable LED solution to replace older, less efficient high bay lighting. Jim Sekinger, COO of Foreverlamp states, “It was an easy decision to turn to Delta, the global leader in power and thermal management solutions, to develop the custom LED drivers that we were looking for to fit the stringent performance and mechanical requirements for the 200W and 600W Foreverlamp Classic LED fixture models”. Delta is the original design manufacturer of choice for many Fortune 500 companies so when Foreverlamp needed a uniquely shaped LED driver that would not only fit inside the Classic Series fixture housing but also provide many years of reliable performance, Delta was an natural choice.